This image is of a Carolinachelys wilsoni loggerhead turtle fossil on display at Mace Brown Museum of Natural History (August 2017). They date to the Oligocene Epoch (about 11-5.3 million years ago), Paleogene Period. The fossil was found in Summerville South Carolina USA. This image is of pygmy sperm whale (family Kogiidae) ear bone fossils on display at Mace Brown Museum of Natural History (August 2017). They date to the Late Miocene Epoch (about 11-5.3 million years ago), Neogene Period. 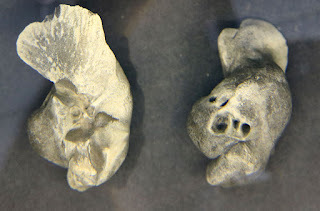 The fossils were found in Hawthorn Formation of Bone Valley Florida USA.